Selecting the right western saddle can be challenging, especially for beginners who don't understand the distinctions between styles of saddles and the specific features that are available from style to style. The ideal saddle helps keep the rider in the proper riding position, comfortably, during hours of practice. Some sizing is necessary. What's comfortable differs from one rider to the next. Finding the right saddle is often a process of trial and error. Quality is your No. 1 concern when choosing a saddle. Good quality saddles are most often manufactured by established, respected saddle companies in the United States, Canada or Europe. Such saddles have manufacturer or saddle maker's marks clearly visible; they're made of thick, pliable, sturdy leather. Poor quality saddles -- often marketed to novices -- can seem appealing because of their low prices. Poor quality saddles use cheap materials processes; profit margin is the maker's goal, rather than saddles that stand up to decades of use. Cheap saddles are often uncomfortable to ride in; they break down during use rather than breaking in comfortably; and they rarely assist the rider in maintaining good riding positions. The worst of the cheap saddles were designed with absolutely no consideration to either horse or rider comfort; these often cause significant problems and discomfort during use. Start shopping by trying medium to good quality saddles and avoid those that have no name brand, are poorly constructed or were imported from India, China or Mexico. Riding in a saddle of improper fit is a sure way to wind up uncomfortable, if not at risk. Saddle seats are measured in inches, most adult saddles measuring between 14 and 17 inches. The shape of the seat affects fit significantly, so you will still need to try various saddles to find the right fit for you. Knowing what size of seat generally fits you best greatly helps narrow your search for the right saddle. Sitting in a wide assortment of saddles will help you decide what feels most comfortable for your unique body shape and riding position.You should be able to sit comfortably in the saddle with a couple of inches of space between your pelvis and the pommel, which is otherwise known as the front of the saddle. You should also have several inches of space between your rear end and the cantle, which is the back of the seat. It is easy for beginning riders to wind up with the wrong style of Western saddle if you do not have a good understanding of Western riding disciplines and the differences between the styles of Western saddle. Western riding is made up of a number of different riding disciplines including barrel racing, cutting, reining, western pleasure, roping and trail riding. 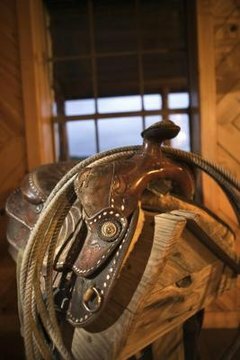 Western saddles are customized for use in specific disciplines to give the rider an edge and to make riding properly easier. Trail and pleasure saddles are normally designed for rider comfort and to provide a smooth ride while roping; reining and cutting saddles are designed more for doing a job rather than for rider comfort. If you are going to be riding in a specific discipline, you will need to choose your new saddle for purpose first and then for comfort. Some saddles are easier and more comfortable to ride in than others. As a beginner shopping for a comfortable saddle, you will want to learn about the features that can help make sure your saddle meets your individual needs. You can also look for specific options when you are out saddle shopping. Beginners are generally more secure in saddles with deeper seat shapes, which help hold them in the saddles. Some saddles feature grippy suede seats, others have slick leather seats. Suede seats help prevent riders from sliding in their saddles, making the rider position more secure. Padded seats tend to be more comfortable than those with minimal padding. You can add a gel pads over saddle seats to make them more comfortable. Stirrups are available in various shapes and widths to suit the rider's foot shape and leg position.